For the private school, see University of San Diego. For the public California State University school, see San Diego State University. "UCSD" redirects here. For other uses, see UCSD (disambiguation). The University of California, San Diego (UC San Diego, or colloquially, UCSD[a]) is a public research university located in the La Jolla neighborhood of San Diego, California, in the United States. The university occupies 2,141 acres (866 ha) near the coast of the Pacific Ocean, with the main campus resting on approximately 1,152 acres (466 ha). Established in 1960 near the pre-existing Scripps Institution of Oceanography, UC San Diego is the seventh-oldest of the 10 University of California campuses and offers over 200 undergraduate and graduate degree programs, enrolling approximately 30,000 undergraduate and 8,500 graduate students. The university operates 19 organized research units (ORUs), including the Center for Energy Research, Qualcomm Institute (a branch of the California Institute for Telecommunications and Information Technology), San Diego Supercomputer Center and the Kavli Institute for Brain and Mind, as well as eight School of Medicine research units, six research centers at Scripps Institution of Oceanography and two multi-campus initiatives, including the Institute on Global Conflict and Cooperation. UC San Diego is also closely affiliated with several regional research centers, such as the Salk Institute, the Sanford Burnham Prebys Medical Discovery Institute, the Sanford Consortium for Regenerative Medicine and the Scripps Research Institute. According to the National Science Foundation, UC San Diego spent $1.133 billion on research and development in fiscal year 2017, ranking it 7th in the nation. As of August 2018, UC San Diego faculty, researchers and alumni have won 27 Nobel Prizes and 3 Fields Medals, eight National Medals of Science, eight MacArthur Fellowships, and two Pulitzer Prizes. Additionally, of the current faculty, 29 have been elected to the National Academy of Engineering, 70 to the National Academy of Sciences, 45 to the Institute of Medicine and 110 to the American Academy of Arts and Sciences. When the Regents of the University of California originally authorized the San Diego campus in 1956, it was planned to be a graduate and research institution, providing instruction in the sciences, mathematics, and engineering. Local citizens supported the idea, voting the same year to transfer to the university 59 acres (24 ha) of mesa land on the coast near the preexisting Scripps Institution of Oceanography. The Regents requested an additional gift of 550 acres (220 ha) of undeveloped mesa land northeast of Scripps, as well as 500 acres (200 ha) on the former site of Camp Matthews from the federal government, but Roger Revelle, then director of Scripps Institution and main advocate for establishing the new campus, jeopardized the site selection by exposing the La Jolla community's exclusive real estate business practices, which were antagonistic to minority racial and religious groups. This outraged local conservatives, as well as Regent Edwin W. Pauley. UC President Clark Kerr satisfied San Diego city donors by changing the proposed name from University of California, La Jolla, to University of California, San Diego. The city voted in agreement to its part in 1958, and the UC approved construction of the new campus in 1960. Because of the clash with Pauley, Revelle was not made chancellor. Herbert York, first director of Lawrence Livermore National Laboratory, was designated instead. York planned the main campus according to the "Oxbridge" model, relying on many of Revelle's ideas. UC San Diego was the first general campus of the University of California to be designed "from the top down" in terms of research emphasis. Local leaders disagreed on whether the new school should be a technical research institute or a more broadly based school that included undergraduates as well. John Jay Hopkins of General Dynamics Corporation pledged one million dollars for the former while the City Council offered free land for the latter. The original authorization for the San Diego campus given by the UC Regents in 1956 approved a "graduate program in science and technology" that included undergraduate programs, a compromise that won both the support of General Dynamics and the city voters' approval. Nobel laureate Harold Urey, a physicist from the University of Chicago, and Hans Suess, who had published the first paper on the greenhouse effect with Revelle in the previous year, were early recruits to the faculty in 1958. Maria Goeppert-Mayer, later the second female Nobel laureate in physics, was appointed professor of physics in 1960. The graduate division of the school opened in 1960 with 20 faculty in residence, with instruction offered in the fields of physics, biology, chemistry, and earth science. Before the main campus completed construction, classes were held in the Scripps Institution of Oceanography. By 1963, new facilities on the mesa had been finished for the School of Science and Engineering, and new buildings were under construction for Social Sciences and Humanities. Ten additional faculty in those disciplines were hired, and the whole site was designated the First College, later renamed after Roger Revelle, of the new campus. York resigned as chancellor that year and was replaced by John Semple Galbraith. The undergraduate program accepted its first class of 181 freshman at Revelle College in 1964. Second College was founded in 1964, on the land deeded by the federal government, and named after environmentalist John Muir two years later. The School of Medicine also accepted its first students in 1966. Political theorist Herbert Marcuse joined the faculty in 1965. A champion of the New Left, he reportedly was the first protester to occupy the administration building in a demonstration organized by his student, political activist Angela Davis. The American Legion offered to buy out the remainder of Marcuse's contract for $20,000; the Regents censured Chancellor McGill for defending Marcuse on the basis of academic freedom, but further action was averted after local leaders expressed support for Marcuse. Further student unrest was felt at the university, as the United States increased its involvement in the Vietnam War during the early 1960s, when a student raised a Viet Minh flag over the campus. Protests escalated as the war continued and were only exacerbated after the National Guard fired on student protesters at Kent State University in 1970. Over 200 students occupied Urey Hall, with one student setting himself on fire in protest of the war. Early research activity and faculty quality, notably in the sciences, was integral to shaping the focus and culture of the university. Even before UC San Diego had its own campus, faculty recruits had already made significant research breakthroughs, such as the Keeling Curve, a graph that plots rapidly increasing carbon dioxide levels in the atmosphere and was the first significant evidence for global climate change; the Kohn–Sham equations, used to investigate particular atoms and molecules in quantum chemistry; and the Miller–Urey experiment, which gave birth to the field of prebiotic chemistry. Engineering, particularly computer science, became an important part of the university's academics as it matured. University researchers helped develop UCSD Pascal, an early machine-independent programming language that later heavily influenced Java, the National Science Foundation Network, a precursor to the Internet, and the Network News Transfer Protocol during the late 1970s to 1980s. In economics, the methods for analyzing economic time series with time-varying volatility (ARCH), and with common trends (cointegration) were developed. UC San Diego maintained its research intense character after its founding, racking up 25 Nobel Laureates affiliated within 50 years of history; a rate of four per decade. Under Richard C. Atkinson's leadership as chancellor from 1980 to 1995, the university strengthened its ties with the city of San Diego by encouraging technology transfer with developing companies, transforming San Diego into a world leader in technology-based industries. He oversaw a rapid expansion of the School of Engineering, later renamed after Qualcomm founder Irwin M. Jacobs, with the construction of the San Diego Supercomputer Center and establishment of the computer science, electrical engineering, and bioengineering departments. Private donations increased from $15 million to nearly $50 million annually, faculty expanded by nearly 50%, and enrollment doubled to about 18,000 students during his administration. By the end of his chancellorship, the quality of UC San Diego graduate programs was ranked 10th in the nation by the National Research Council. The university continued to undergo further expansion during the first decade of the new millennium with the establishment and construction of two new professional schools — the Skaggs School of Pharmacy and Rady School of Management—and the California Institute for Telecommunications and Information Technology, a research institute run jointly with UC Irvine. UC San Diego also reached two financial milestones during this time, becoming the first university in the western region to raise over $1 billion in its eight-year fundraising campaign in 2007 and also obtaining an additional $1 billion through research contracts and grants in a single fiscal year for the first time in 2010. Despite this, due to the California budget crisis, the university loaned $40 million against its own assets in 2009 to offset a significant reduction in state educational appropriations. The salary of Pradeep Khosla, who became chancellor in 2012, has been the subject of controversy amidst continued budget cuts and tuition increases. On November 27, 2017, the university announced it would leave its longtime athletic home of the California Collegiate Athletic Association, an NCAA Division II league, to begin a transition to Division I in 2020. At that time, it will join the Big West Conference, already home to four other UC campuses (Davis, Irvine, Riverside, Santa Barbara). The transition period will run through the 2023–24 school year. UC San Diego is located in the residential neighborhood of La Jolla of northern San Diego, California, bordered by the communities of La Jolla Shores, Torrey Pines, and University City. The main campus consists of 761 buildings that occupy 1,152 acres (466 ha), with natural reserves covering about 889 acres (360 ha) and outlying facilities taking up the remaining area. The San Diego Freeway passes through the campus and separates Jacobs Medical Center and Mesa apartment housing from the greater part of the university. The Preuss School, a college-preparatory charter school established and administered by UC San Diego, also lies on the eastern portion of the campus. Standing at the center of the university is the iconic Geisel Library, named after Dr. Seuss. Library Walk, a heavily traveled pathway leading from the library to Gilman Drive, lies adjacent or close to Price Center, Center Hall, International Center, and various student services buildings, including the Student Services Center and the Career Services building. The layout of the main campus centers on Geisel Library, which is roughly surrounded by the six residential colleges of Revelle, Muir, Marshall, Warren, Roosevelt, and Sixth, and the School of Medicine. The six colleges maintain separate housing facilities for their students and each college's buildings are differentiated by distinct architectural styles. As residential colleges were added while the university expanded, buildings in newer colleges were designed with styles that were starkly different from that of the original campus. The disparate architectural styles led Travel + Leisure, in its October 2013 issue, to name the university as one of the ugliest campuses in America, likening it to "a cupboard full of kitchen appliances whose function you can't quite fathom." In addition to its academic and housing facilities, the campus features eucalyptus groves, the Birch Aquarium and museum, and several major research centers. The Scripps Institution owns a sea port and several open ocean vessels for marine research. Several large shake facilities, including the world record holding Large High Performance Outdoor Shake Table, used for earthquake simulations, are also maintained by the university. The university has actively sought to reduce carbon emissions and energy usage on campus, earning a "gold" sustainability performance rating in the Sustainability Tracking Assessment and Rating System (STARS) survey. It was also praised in The Princeton Review's Guide to 322 Green Colleges: 2013 Edition for its strong commitment to sustainability in its academic offerings, campus infrastructure, activities and career preparation. When the campus opened in 1964, it consisted only of Revelle College and Scripps Institution of Oceanography. The school's rapid increase in enrollment and opening to undergraduate students over its first decade spurred major campus expansion. Muir, Marshall, and Warren Colleges were established and built during the late 1960s through 1980s as the student population continued to grow considerably. Initially, the campus followed a rough north-south axis alongside Historic Route 101, though construction in the following decades deviated from this, with the core of the campus shifting towards Geisel Library. Since the merging of the school's two engineering departments into a single School of Engineering in 1982, new buildings have been continually added as the division expands. Major additions include: the San Diego Supercomputer Center, completed in 1986; Powell-Focht Bioengineering Hall, completed in 2003; and the Structural and Materials Engineering building, completed in 2012. Significant construction work on the previously undeveloped northern part of campus also took place during this time. Two graduate professional schools, the School of Global Policy and Strategy and Rady School of Management, were constructed in the area adjacent to and near the Supercomputer Center, as well as Roosevelt College, a transfer student apartment complex called The Village at Torrey Pines, and the RIMAC athletic facilities. Additionally, the Conrad Prebys Music Center was completed in 2009 as part of an expanding arts district to house UC San Diego's music department, renowned for its programs in experimental music. More than a dozen public art projects, part of the Stuart Collection, decorate the campus. Perhaps the most famous of these is the Sun God, a large winged creature located near the Faculty Club. Other collection pieces include a collection of Stonehenge-like stone blocks, a house sitting atop an engineering building in Warren College called Fallen Star, a table by Jenny Holzer, a building that flashes the names of vices and virtues in bright neon lights, and three metallic Eucalyptus trees. The collection also includes a large coiling snake path whose head guides towards Geisel Library, with a quote from John Milton's Paradise Lost carved along its length: "And wilt thou not be loath to leave this Paradise, but shalt possess a Paradise within thee, happier far." The path circles around its own garden and a large granite book-shaped block. One of the newest additions to the collection is Tim Hawkinson's giant teddy bear made of six boulders located in between the newly constructed Calit2 buildings. Another notable campus sight was the graffiti staircase of Mandeville Hall, a series of corridors that had been tagged with graffiti by generations of students over decades of use; this was recently replaced with the Graffiti Art Park. Students in the university's visual arts department also create temporary public art installations as part of their coursework. The university is sponsoring a $56,000 performance art project to develop a sense of community at the sprawling campus. UC San Diego maintains about 17,000 parking spaces and offers a number of alternative transportation options. The university runs a shuttle system, which is provided free for students, faculty, and staff, that services the main campus, UC San Diego Medical Center, university affiliated research centers, nearby apartment complexes and shopping centers in University City, and the Sorrento Valley train station. As part of a greater initiative to reduce the university's impact on the environment, a portion of the shuttle fleet has been refitted to exclusively use biodiesel fuel derived from vegetable oil. 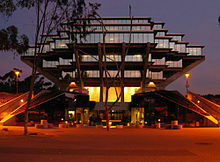 UCSD also reserves parking spaces for carpools, maintains a fleet of on-campus Zipcars, and provides free bike rentals. The San Diego Association of Governments and the Metropolitan Transit System are planning to bring San Diego Trolley service to the local area. The project will extend the existing Blue Line north to UC San Diego and the University City area from Downtown San Diego. The extension will give the university campus two trolley stations, East and West. There is also a proposed station at the Veterans Administration hospital just south of UCSD. A major goal of the project is to ease traffic and parking on campus while providing more accessible transportation to nearby areas. Construction began in 2016, with service expected to begin in 2021. As part of UCSD's existing public transit partnerships, all students have unlimited access to MTS regional buses and trolleys, as well as most North County Transit District transportation services upon paying a "transportation fee" in registration. 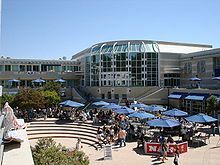 UC San Diego is a large, primarily residential, public research university accredited by the Western Association of Schools and Colleges that offers a four-year Bachelor of Arts and Bachelor of Science degree to undergraduate students. The full-time undergraduate program comprises the majority of enrollments at the university. The university offers 125 bachelor's degree programs organized into five disciplinary divisions: arts and humanities, biological sciences, engineering, mathematics and physical sciences, and social sciences. Students are also free to design special majors or engage in dual majors. 38% of undergraduates major in the social sciences, followed by 25% in biological sciences, 18% in engineering, 8% in sciences and math, 4% in humanities, and 3% in the arts. UC San Diego's comprehensive graduate program is composed of several divisions and professional schools, including the Scripps Institution of Oceanography, School of Medicine, Institute of Engineering in Medicine, School of Global Policy and Strategy, Jacobs School of Engineering, Rady School of Management, and Skaggs School of Pharmacy. The university offers 35 masters programs, 47 doctoral programs, five professional programs, and nine joint doctoral programs with San Diego State University and other UC campuses. UC San Diego has highly ranked graduate programs in biological sciences and medicine, economics, social and behavioral sciences, physics, and computer engineering. The university also offers a continuing and public education program through UC San Diego Extension. Approximately 50,000 enrollees per year are educated in this branch of the university, which offers over 100 professional and specialized certificate programs. Courses are offered at Extension facilities, located both on the main campus and off-campus, and also online. UC San Diego Extension offers programs in Arts & Humanities, Business & Leadership, Data Analysis & Mathematics, Digital Arts, Education, Engineering, Environment & Sustainability, International Programs, Languages, Law, Occupational Safety & Health, Pre-College, Sciences, Technology, and Writing, as well as public programs such as the UC San Diego Osher Lifelong Learning Institute and the Helen Edison Lecture Series. UC San Diego Extension also plans to open a 66,000-square-foot hub at the corner of Park Boulevard and Market Street in East Village referred to as the Innovative Cultural and Education Hub. The project is slated to be completed in 2020 and plans to "advance the burgeoning tech ecosystem downtown, contribute to the city’s lively arts and culture scene, and connect in multiple ways with diverse neighborhoods such as Barrio Logan, the Diamond District and Golden Hill." Revelle College, founded in 1964 as First College, emphasizes a "Renaissance education" through the Humanities sequence which integrates history, literature, and philosophy. It has highly structured requirements. John Muir College, founded in 1967 as Second College, emphasizes a "spirit of self-sufficiency and individual choice" and offers loosely structured general-education requirements. Thurgood Marshall College, founded in 1970 as Third College, emphasizes "scholarship, social responsibility and the belief that a liberal arts education must include an understanding of one's role in society". Earl Warren College, founded in 1974 as Fourth College, requires students to pursue a major of their choice while also requiring two "programs of concentration" in disciplines unrelated to each other and to their major "toward a life in balance". Eleanor Roosevelt College, founded in 1988 as Fifth College, focuses its core education program on a cross-cultural interdisciplinary course sequence entitled "Making of the Modern World", has a foreign language requirement, and encourages studying abroad. Sixth College, founded in 2002, has a focus on "historical and philosophical connections among culture, art and technology." Students affiliate with a college based upon its particular philosophy and environment as majors are not exclusive to specific colleges. Revelle and Sixth enroll the largest number of undergraduate students, followed by Warren, Muir, Roosevelt, and Marshall. Each undergraduate college sets different requirements for awarding graduation and provost's honors, separate from departmental and Phi Beta Kappa honors. Washington Monthly has ranked UC San Diego first in the nation in three categories: social mobility (recruiting and graduating low-income students), research (producing cutting-edge scholarship and PhDs), and service (encouraging students to give something back to their country). UC San Diego ranked fifth in the nation in terms of research and development expenditures in 2015, with $1.101 billion spent. Kiplinger in 2014 ranked UC San Diego 14th out of the top 100 best-value public colleges and universities in the nation, and 3rd in California. UC San Diego was ranked 42nd among the top universities in the United States and 9th among public universities by U.S. News & World Report's 2018 rankings. The Daily Beast ranked UC San Diego 38th in the country out of the nearly 2000 schools it evaluated for its 2013 Best Colleges ranking. The university is ranked 12th and 15th in the U.S. by Academic Ranking of World Universities and Center for World University Rankings respectively. Money Magazine ranked UC San Diego 46th in the country out of the nearly 1500 schools it evaluated for its 2014 Best Colleges ranking. ScienceWatch ranks UC San Diego 7th of federally funded U.S. universities, based on the citation impact of their published research in major fields of science and the social sciences and 12th globally by volume of citations. The Foundation for Individual Rights in Education featured UCSD as one of its 2016 "10 Worst Colleges for Free Speech". Recognized as a Public Ivy, UC San Diego is a highly regarded research institution, ranked 11th in the world by the Nature Index, 14th in the world by the Scrimago Institutions Rankings, 14th in the world by the Lens Metric, 14th best university in the world according to TBS Rankings, 16th in U.S. News & World Report 's 2017 global university rankings, 15th best university in the world by Webometrics Ranking of World Universities, 15th in the world by the Academic Ranking of World Universities, 16th best university in the world by the Centre for Science and Technology Studies of Leiden University Ranking, 18th in the world by the Center for World University Rankings, 18th in the world by University Ranking by Academic Performance, and 5th best public university in the world by the Times Higher Education World University Rankings. The University of California San Diego is ranked 15th by the Academic Ranking of World Universities, and is ranked 17th "Best University in the World" by the Center for World University Rankings for 2016. U.S. News & World Report named UC San Diego the 15th best university in the world for 2017 for research, global and regional reputation, international collaboration and number of highly cited papers. In 2017, UC San Diego was ranked 30th in the world by the Times Higher Education World University Rankings. UC San Diego was also ranked 38th overall in the world, and 11th in biological sciences, 16th in life sciences and medicine, 19th in economics and econometrics, 31st in mathematics, and 44th in computer science and information systems by QS World University Rankings. In 2015 the Centre for Science and Technology Studies at Leiden University named UC San Diego 16th in the world for scientific impact. The UC San Diego School of Medicine is ranked tied for 18th for research and 12th for primary care in the 2018 U.S. News & World Report rankings. The Rady School of Management at UC San Diego is ranked 17th in the world for faculty research and 8th for alumni entrepreneurship in the 2014 Financial Times’ Global MBA. In 2014 the Rady School ranked 1st in the nation in intellectual capital by Bloomberg Businessweek, which measured faculty research published in the top 20 business journals from 2009-2013. UC San Diego was named 8th in the nation among doctoral institutions for the number of students who study abroad for a full academic year, according to the Institute of International Education Open Doors report. Three doctoral programs at UC San Diego—biological sciences, bioengineering and Scripps Institution of Oceanography—are 1st in the nation in the National Research Council's Data-Based Assessment of Research-Doctorate Programs report. Departmental rankings (including specialties) in the national top 10 according to the 2018 U.S. News & World Report Best Graduate Schools report include biomedical engineering/bioengineering (2nd); neuroscience/neurobiology (2nd); biochemistry(10th); discrete mathematics and combinatorics (3rd); plasma physics (7th); econometrics (4th); public finance (8th); political science (9th); international politics (4th); comparative politics (4th); behavioral neuroscience (4th); cognitive psychology (8th); and time-based media/new media (3rd). Departmental rankings in the global top 10 according to the 2015 U.S. News & World Report Best Graduate Schools report include: biology and biochemistry (6th); molecular biology and genetics (8th); neuroscience and behavior (6th); pharmacology and toxicology (5th); and psychiatry and psychology (8th). Departmental rankings in the global top 20 according to the Academic Ranking of World Universities (ARWU) for 2015 include chemistry (18th); computer science (14th); and economics/business (19th). Departmental rankings in the global top 20 according to the QS World University Rankings for 2015 include earth and marine sciences (13th); biological sciences (14th); economics and econometrics (18th); and pharmacy and pharmacology (20th). Additional rankings within the global top 40 include politics and international studies (21st); medicine (22nd); mathematics (28th); linguistics (31st); and electrical engineering (34th). ScienceWatch placed UC San Diego 1st in social psychology, 2nd in oceanography, 3rd in international relations, 5th in molecular biology and genetics, 17th in engineering, and 18th in Neuroscience and Behavior using non-survey, quantitative based metrics to determine research impact. The Hollywood Reporter listed the graduate theatre program among the top twenty-five drama schools, placing it fourth. UC San Diego is categorized by U.S. News & World Report as "most selective" for college admissions ratings within the United States. For the Fall 2018 admissions cycle, the school received 118,372 applications from both freshman and transfer applicants, the second highest among the University of California campuses. Of those 118,372 applications, 97,899 applications were from prospective freshman with UC San Diego granting admission to just 29,577 applicants giving the institution an acceptance rate of 30.2% for the fall 2018 admission cycle. In 2009, UC San Diego mistakenly sent Admit Day welcome emails to all its 47,000 freshmen applicants, instead of just the 17,000 who had been admitted. However, school officials quickly realized the mistake and sent an apology email within two hours. Graduate admissions are largely centralized through the Office of Graduate Studies. However, the Rady School of Management, Scripps Institution of Oceanography, and the School of Global Policy and Strategy (GPS) handle their own admissions. For Fall 2012, the UC San Diego School of Medicine offered admission to 5% of its applicants. As one of the 10 general campuses of the University of California system, UC San Diego is governed by a 26-member Board of Regents consisting of 18 officials appointed by the Governor of California, seven ex officio members, and a single student regent. The current president of the University of California is Janet Napolitano, and the administrative head of UC San Diego is Pradeep Khosla. Academic policies are set by the school's Academic Senate, a legislative body composed of all university faculty members. Nine vice chancellors manage academic affairs, research, diversity, marine sciences, student affairs, planning, external relations, business affairs, and health sciences and report directly to the chancellor. In all, the university offers classical orchestras, intramural sports, and over 550 student organizations. 38 national and local Greek organizations are hosted on campus, with fraternity and sorority members representing 20% of the student population. The university operates on an academic quarter system, with three primary quarters beginning in late September and ending in mid-June. 44% of undergraduate students receive federal Pell Grants. The undergraduate student body government is the Associated Students of the University of California, San Diego, organized as a cabinet and senate, while graduate students are represented by the Graduate Student Association, a proportional representative body with membership depending on the number of students in each graduate department. Additionally, graduate students who serve as teaching assistants are represented by the UC-wide union of Academic Student Employees. Each of the six residential colleges has its own student council as well. Most student media publications distributed on-campus are services provided and governed by ASUCSD, including Triton TV, a film studio and TV station, and the KSDT radio station. A notable exception is The Guardian, which is directly governed by the university's Student Affairs department. Price Center, often referred to as PC, is the main student hub and is located in the center of campus, just south of Geisel Library. The building houses multiple restaurants, the central bookstore, a movie theater, and office space for student organizations, organization advisers, and university faculty. A student referendum was passed in 2003 to expand the Price Center to nearly double its original size. The Price Center East expansion was officially opened to the public on May 19, 2008. There are also three campus centers that cultivate a sense of community among faculty, staff, and certain students: the Cross-Cultural Center, the Women's Center, and the LGBT Resource Center. UC San Diego was the last UC campus to have such centers. All three, especially the Cross-Cultural Center that was created first, were founded in the mid-1990s as a result of student movements that demanded change despite opposition by the campus administration. The Ché Café is a student worker cooperative and social center that is perhaps best known for its role as a venue for underground music scene. It is an on-and-off again vegan cafe and catering operation as well. The Ché also acts as a resource for the music and art departments on campus through hosting art shows, performances, and film screenings. Some of the most notable touring bands or musicians who have played at the Ché include: Bon Iver, Green Day, Rise Against, Jimmy Eat World, Matt & Kim, Billy Corgan, Blonde Redhead, Bomb the Music Industry!, The Get Up Kids, Deerhoof, Bright Eyes, Chumbawamba, Mike Watt, Hella, Dan Deacon, Unwound, and Jawbreaker. Prominent local San Diego bands such as The Locust and Pinback, and national tours such as Mates of State and The Dillinger Escape Plan have given the Ché Café some fame and praise as a radical vegan collective despite its small size and limited sound equipment. The student body government coordinates a wide variety of concerts and events during the year. UC San Diego begins the fall quarter with Welcome Week to introduce new students to campus clubs and activities, starting the week with the All Campus Dance. The Hullabaloo music festival takes place every November as part of the university's Founders' Celebration. Bear Garden, a carnival held near Price Center, takes place every quarter throughout the year. Additionally, events are frequently held at the Loft, a performance lounge within Price Center. Sun God Festival, named after the statue part of the Stuart Collection, is the largest and most significant event of the year, held annually in mid-May on the seventh week of the spring quarter. The festival has grown over its 30-year history into a 20,000 person event, featuring an eclectic mix of art, dance, and musical performances. Past performers have included: Kendrick Lamar, Porter Robinson, Macklemore, Silversun Pickups, Wiz Khalifa, Drake, T.I., Third Eye Blind, Ludacris, Michelle Branch, Sara Bareilles, The Roots, and My Chemical Romance. The 2017 festival featured ScHoolboy Q, DJ Mustard, Bad Suns, Manila Killa and Khalid. Two other popular campus traditions include the Pumpkin Drop and the Watermelon Drop, which take place during Halloween and at the end of the spring quarter, respectively. The Watermelon Drop is one of the campus' oldest traditions, famously originating in 1965 from a physics exam question centering on the velocity on impact of a dropped object. A group of intrigued students pursued that line of thought by dropping a watermelon from the top floor of Revelle's Urey Hall to measure the distance from the splat to the farthest travelling piece of fruit. A variety of events surround the Watermelon Drop, including a pageant where an occasionally male but generally female "Watermelon Queen" is elected. The Pumpkin Drop is a similar event celebrated by the dropping of a large, candy-filled pumpkin from 11-story Tioga Hall, the tallest residential building on the Muir college campus. The six undergraduate residential colleges have separate, unique housing facilities for their students. First-year students are usually housed in the residence halls while upperclassmen live in the college apartments. Transfer students are housed in separate facilities from the residential colleges, in an area adjacent to Eleanor Roosevelt College called The Village at Torrey Pines. The housing facilities vary in design, though nearly all of them are of modern or brutalist style. The vast majority of entering freshmen and about 40 percent of all undergraduates in Fall 2012 chose to live in campus residence halls or apartments, with roughly 70 percent of all incoming freshman living in triple occupancy rooms. Graduate students can choose to live in one of six apartment complexes apart from undergraduate housing. Three of these facilities are several minutes away from UC San Diego while the remaining are located on university grounds. Accommodations are made for students with specific needs. Undergraduate couples and families have the option of living in housing facilities that are normally available only to graduate students. The university also dedicates a portion of its facilities for those who wish to live in gender-neutral or LGBT housing. Reflecting UC San Diego's diversity, International House, a complex of apartments located in Eleanor Roosevelt College, is dedicated to cross-cultural exchange between American and international students, housing about 350 students from more than 30 countries. International learning is fostered through formal programs including current affairs discussions, cultural nights, and a community newsletter. Upper-division undergraduates from all six colleges, graduate students, faculty, and researchers are eligible to live in International House, located in the Eleanor Roosevelt College townhouses. Demand is very high for this special program and there is often a waitlist. Spaces in International House are not guaranteed and admission requires a separate application. Housing plans also offer students access to dining facilities, which were named by PETA as the most vegan-friendly in the United States. Each student is allotted a certain number of "Dining Dollars" to purchase meals at any dining hall and groceries at any on-campus market. Six distinct dining halls are located at each of the six colleges, with markets located adjacent or near them, except at Eleanor Roosevelt College which shares a marketplace with The Village. In addition to the six dining halls, there are also four specialty dining facilities and two food trucks on campus that accept dining dollars. UC San Diego currently offers two years guaranteed housing to both its incoming freshmen and its incoming transfer students. UCSD boasts a large Greek community and supports several fraternities and sororities, each belonging to one of three different governing councils. Social fraternities belong to the Interfraternity Council, while social sororities belong to the Panhellenic Council. The university also sponsors a Multicultural Greek Council which currently recognizes 8 fraternities and 7 sororities. Greek life at UCSD is unique to that of most other universities in that Greek organizations do not have chapter houses. On November 27, 2017, the university announced that its athletic programs have begun a 6-year transition process from NCAA Division II to Division I, where it will be a member of the Big West Conference. As of 2017 most of UC San Diego's 23 intercollegiate varsity athletic teams still participate in Division II, 12-member California Collegiate Athletic Association, and some compete independently. The water polo, fencing, and men's volleyball teams compete as part of Division I conferences. Before joining Division II in 2000, the school participated at the Division III level. The teams compete at the university's RIMAC facility, Triton Ballpark, and RIMAC Arena. University of California, San Diego was ranked #1 among all NCAA D2 schools in the country and #40 overall (for all divisions), according to the Next College Student Athlete's 2018 NCSA Power Rankings . The NCSA Power Rankings recognize the best colleges and universities in the U.S. for student-athletes . UC San Diego athletics also ranked #1 in men's and women's soccer, women’s volleyball, men's and women's basketball, men's and women's swimming, men's and women's track and field, men's and women's tennis, men's golf, women's rowing, softball, and baseball, among all NCAA D2 schools. Additionally, UC San Diego ranked #1 in Men's Water Polo and Men's Volleyball among NCAA D1 schools . In all, the Tritons have won a total of 30 national championships in golf, soccer, softball, tennis, volleyball, and water polo. The 2006–07 season was marked as UC San Diego's best since moving to Division II, with 19 athletic programs qualifying for post-season competition, including 17 for the NCAA Championships. Eight of those teams finished with a top five national ranking. Until 2007, UC San Diego was the only Division II school that did not offer athletic scholarships. In 2005, the NCAA created a rule that made it mandatory for all D-II programs to award athletic grants. Consequently, a measure was proposed to begin offering $500 "grants-in-aid" to all 600 intercollegiate athletes in order to meet this requirement. A student referendum was passed in February 2007, authorizing a $329 annual student fee to fund a raise in coaches' salaries, hire more trainers, and provide all athletes with a $500 scholarship. The athletic department considered a move to Division I in 2011. The student body would have needed to approve a doubling of student fees to allow the university to meet minimum scholarship requirements for D-I participation. However, students overwhelmingly rejected this measure in 2012, halting any efforts for a move to Division I at that time. On May 24, 2016, students at UC San Diego passed the vote to move their athletics to NCAA Division I. The school's newspaper, The Guardian, reported that voter turnout was 35 percent of the undergraduate population, when the measure only needed 20 percent to pass. The university offers 29 sports club teams, including rugby, badminton, baseball, cycling, dancesport, ice hockey, sailing, soccer, snow skiing, tennis, volleyball, ultimate, water polo, and waterskiing. The UC San Diego surf team has won the national championship six times and is consistently rated one of the best surfing programs in the United States. UC San Diego does not have a football team. However, the university participated in intercollegiate football for one year during the 1968 season. The newly recruited Tritons lost all seven games that they played. ^ The university's public relations department prefers University of California San Diego (with no comma) or UC San Diego instead of the common initialism UCSD, because the acronym is similar to those of other San Diego higher education institutions. ^ "About Scripps". Scripps Institution of Oceanography. Retrieved May 9, 2013. ^ a b c d "Campus Timeline". University of California, San Diego. Retrieved April 29, 2013. ^ As of June 30, 2018. "University of California Annual Endowment Report, Fiscal Year Ended June 30, 2018" (PDF). University of California Office of the President. 2018. Retrieved January 12, 2019. ^ a b Gardener, Michael (May 16, 2012). "New UCSD Leader's Salary Draws Fire". U-T San Diego. Retrieved May 5, 2013. ^ "University of California Full-Time and Part-Time Headcount - SMG & MSP, Academic and PSS Personnel" (PDF). University of California Office of the President. October 2014. Archived from the original (PDF) on April 13, 2015. ^ a b c "UC San Diego Student Profile 2017–2018" (PDF). UC San Diego Institutional Research. Retrieved February 24, 2018. ^ "UC Financial Reports – Campus Facts in Brief" (PDF). University of California. October 2011. p. 9. Retrieved November 17, 2012. ^ "UC San Diego Brand Guidelines" (PDF). May 4, 2018. Retrieved August 11, 2018. ^ "UCSD Mascot - King Triton". UC San Diego Athletics. University of California, San Diego. September 6, 2005. Retrieved February 18, 2012. ^ "Use of the university name". Retrieved May 26, 2017. ^ "Getting to Know San Diego". Office of Graduate Studies. University of California, San Diego. Archived from the original on November 6, 2012. Retrieved February 20, 2013. ^ a b "Long Range Development Plan 2004" (PDF). Physical & Community Planning. University of California, San Diego. pp. 28–29. Retrieved May 5, 2013. ^ "UC San Diego Academics". Retrieved January 18, 2018. ^ "School of Public Health pre-proposal". Retrieved October 17, 2017. ^ "Multidisciplinary Research Institute at UC San Diego Named in Honor of Qualcomm". Retrieved August 19, 2014. ^ "UC San Diego ORU Roster and Contacts". Retrieved August 19, 2014. ^ a b "Rankings by total R&D expenditures". National Science Foundation. ^ "University of California Nobel Laureates". University of California. Retrieved April 30, 2013. ^ a b "About the Faculty". Academic Affairs. University of California, San Diego. Retrieved May 1, 2013. ^ a b "Members of the National Academies". Jacobs School of Engineering. University of California, San Diego. Retrieved February 18, 2012. ^ Jennewein, Chris (April 29, 2015). "5 San Diego Scientists Elected to National Academy". Times of San Diego. Times of San Diego LLC. Retrieved February 18, 2016. ^ a b c d Cite error: The named reference Kerr was invoked but never defined (see the help page). ^ a b c d e f g Stadtman, Verne A. (1970). The University of California, 1868-1968. McGraw-Hill. pp. 407–411. Retrieved May 5, 2013. ^ a b c d e f Gribble, Joanne (September 2000). "Forty Years of UCSD Perspective". San Diego Metropolitan. Archived from the original on April 17, 2008. Retrieved July 20, 2009. ^ Stadtman, Verne A. (1967). "The Centennial Record of the University of California". Office of the Secretary. Regents of the University of California. Retrieved August 10, 2007. ^ "San Diego: Historical Overview". University of California History Digital Archives. University of California, Berkeley. Retrieved February 20, 2013. ^ Fokos, Barberella (August 23, 1887). "The Bourgeois Marxist". San Diego Reader. Retrieved July 20, 2009. ^ "I was in a sit-in at UC San Diego when we heard about the killings at Kent State". OB Rag. May 4, 2010. Retrieved February 20, 2012. ^ Briggs, Helen (December 2, 2007). "50 years on: The Keeling Curve legacy". BBC News. Retrieved February 20, 2013. ^ Miller, Stanley L.; Harold C. Urey (July 1959). "Organic Compound Synthesis on the Primitive Earth". Science. 130 (3370): 245–51. Bibcode:1959Sci...130..245M. doi:10.1126/science.130.3370.245. PMID 13668555. "Dr. Urey is on the staff of the University of California, La Jolla, California"
^ "A Conversation With James Gosling". ACM Queue. Association for Computing Machinery. July 1, 2004. Retrieved May 5, 2013. ^ "UCSD Pascal Copyright". Technology Transfer Office. University of California, San Diego. June 1, 1979. Archived from the original on February 28, 2012. Retrieved February 20, 2013. ^ Foster, Christine (September 2004). "UCSD Pascal and the PC Revolution". UC San Diego Alumni Association. Archived from the original on March 6, 2012. Retrieved February 20, 2013. ^ "The UCSD P-System Museum". Jefferson Computer Museum. Retrieved February 20, 2013. ^ "Network News Transfer Protocol". Internet Engineering Task Force. February 1986. Retrieved February 20, 2013. ^ a b "UCSD Existing Buildings by Location and Year Occupied 2002-03" (PDF). Physical & Community Planning. University of California, San Diego. Retrieved April 29, 2013. ^ "Jacobs School of Engineering Family Tree" (JPG). Jacobs School of Engineering. University of California, San Diego. Retrieved May 3, 2013. ^ Smilor, Raymond; O'Donnell, Niall; Stein, Gregory; Welborn, Robert S. (August 1, 2007). "The Research University and the Development of High-Technology Centers in the United States". Economic Development Quarterly. 21 (3): 203–222. doi:10.1177/0891242407299426. Retrieved July 17, 2009. ^ "UC San Diego Becomes Region's First University to Top $1 Billion in a Fundraising Campaign". UCSD News Center. University of California, San Diego. June 8, 2007. Retrieved July 16, 2009. ^ Yang Su, Eleanor (October 7, 2009). "To soften cuts, UCSD to borrow from itself, $40 million internal loan announced by campus". U-T San Diego. Retrieved May 5, 2013. ^ "Accepted to Big West Conference, UCSD Will Finally Be a Division-I School". UCSD Guardian. Retrieved November 27, 2017. ^ "About Preuss". Preuss School. University of California, San Diego. Retrieved July 16, 2009. ^ "America's Ugliest College Campuses". Travel + Leisure. October 2013. Retrieved September 19, 2014. ^ Henter, Heather (January 2005). "Tree Wars". @ucsd. UCSD Alumni Association. Retrieved February 19, 2012. ^ "The Scripps Fleet". Scripps Institution of Oceanography. University of California, San Diego. Retrieved April 30, 2013. ^ "Nimitz Marine Facility". Scripps Institution of Oceanography. University of California, San Diego. Retrieved April 30, 2013. ^ "About Us". NEES @ UC San Diego. University of California, San Diego. Retrieved April 30, 2013. ^ "UC San Diego Named One of Greenest Colleges in U.S. and Canada by Princeton Review". University of California, San Diego. April 24, 2013. Retrieved April 30, 2013. ^ "Powell-Focht Bioengineering Hall". FacilitiesLink. University of California, San Diego. Retrieved April 29, 2013. ^ "Engineers, Visual Artists and Medical Device Researchers Work Large and Small in New UC San Diego Building". Jacobs School of Engineering. University of California, San Diego. September 5, 2012. Retrieved April 29, 2013. ^ Markhoff, John (November 5, 2005). "Researchers Look to Create a Synthesis of Art and Science for the 21st century". The New York Times. Retrieved February 3, 2008. ^ "About The Park". Artpark.ucsd.edu. February 3, 2014. Retrieved April 9, 2016. ^ Steinberg, Janice (February 18, 2007). "'Place': Building a community at UCSD". U-T San Diego. Retrieved February 7, 2008. ^ Clark, Christine (October 19, 2009). "Students Welcomed to Campus by New Mural Celebrating Chicano History". This Week @ UCSD. Retrieved January 1, 2010. ^ Berestein, Leslie (October 13, 2009). "A celebration of culture". U-T San Diego. Retrieved January 1, 2010. ^ ""Enduring Spell" by El Mac in San Diego". StreetArtNews. Retrieved April 6, 2016. ^ "Alternative Transportation". Sustain UCSD. University of California, San Diego. Archived from the original on April 26, 2013. Retrieved April 28, 2013. ^ "University of California, San Diego Survey of Parking Space Occupancy Levels, Winter 2013" (PDF). UCSD Transportation Services. University of California, San Diego. Retrieved April 28, 2013. ^ "Green Line Shuttle". Sustain UCSD. University of California, San Diego. Archived from the original on April 26, 2013. Retrieved April 28, 2013. ^ "Triton U-Pass". Retrieved February 2, 2015. ^ "Accreditation". University of California, San Diego. Retrieved July 18, 2009. ^ "University of California, San Diego Triton Stats 2007-2008" (PDF). Institutional Research. University of California, San Diego. Archived from the original (PDF) on March 26, 2009. Retrieved July 18, 2009. ^ "Departments and Programs". University of California, San Diego. Archived from the original on May 11, 2013. Retrieved May 5, 2013. ^ "Guidelines for Individual Majors". Revelle College. University of California, San Diego. Archived from the original on November 14, 2012. Retrieved April 29, 2013. ^ "Undergraduate Enrollment by Major Field of Study" (PDF). Student Affairs. University of California, San Diego. Retrieved September 6, 2010. ^ "University of California, San Diego Triton Facts" (PDF). Institutional Research. University of California, San Diego. 2010. Archived from the original (PDF) on March 26, 2009. Retrieved February 20, 2012. ^ "Best Medical Schools: Primary Care Rankings". U.S. News & World Report. 2009. Retrieved May 18, 2009. ^ "Best Computer Engineering Programs". U.S. News & World Report. 2013. Retrieved April 29, 2013. ^ a b c d "About UC San Diego Extension" (PDF). UC San Diego Extension. University of California, San Diego. Retrieved May 5, 2013. ^ WALSHOK, Pradeep K. Khosla & Mary. "UC San Diego's urban hub to be catalyst for region". sandiegouniontribune.com. Retrieved December 17, 2016. ^ Showley, Roger. "UCSD opening permanent downtown outpost". sandiegouniontribune.com. Retrieved December 17, 2016. ^ News, KPBS. "UC San Diego Announces Downtown Hub". KPBS Public Media. Retrieved December 17, 2016. ^ "Undergraduates by College" (PDF). Student Affairs. University of California, San Diego. Retrieved July 18, 2009. ^ "University of California--San Diego - U.S. News Best Grad School Rankings". U.S. News & World Report. Retrieved June 4, 2017. ^ "University of California--San Diego - U.S. News Best Global University Rankings". U.S. News & World Report. Retrieved November 3, 2018. ^ "2010 National University Rankings". Washington Monthly. 2010. Archived from the original on May 1, 2011. Retrieved December 12, 2012. ^ "2011 National University Rankings". Washington Monthly. 2011. Archived from the original on December 10, 2013. Retrieved December 12, 2012. ^ "2012 National University Rankings". Washington Monthly. 2012. Archived from the original on August 30, 2012. Retrieved December 12, 2012. ^ "Kiplinger's Best College Values". Kiplinger. March 2014. ^ "U.S. News Best Colleges Rankings". U.S. News & World Report. Retrieved October 2, 2013. ^ a b "Academic Ranking of World Universities 2014". ShanghaiRanking Consultancy. Archived from the original on January 19, 2015. ^ "The Most-Cited Institutions Overall, 1999-2009". ScienceWatch. Reuters. 2009. Retrieved May 5, 2013. ^ McDonald, Kim (November 15, 2006). "UC San Diego Ranks 7th in Nation for Scientific 'Impact'". University of California, San Diego. Retrieved May 5, 2013. ^ "Nature Index - 2017". natureindex.com. Retrieved September 7, 2017. ^ "Scrimago Institutions Rankings (Higher Education)-2017". Retrieved September 7, 2017. ^ "Lens In4M Metric". lens.org. Retrieved August 9, 2017. ^ "The Best Schools". Retrieved August 6, 2015. ^ a b "U.S. News Best Global Universities Rankings". U.S. News & World Report. Retrieved October 25, 2016. ^ "Ranking Web of Universities". Retrieved September 4, 2017. ^ "Academic Ranking of World Universities - 2017 | World University Ranking - 2017 | Top 500 universities | Shanghai Ranking - 2017". www.shanghairanking.com. Retrieved September 7, 2017. ^ "CWTS Leiden Ranking". Leiden University. Retrieved July 7, 2015. ^ "University of California, San Diego Ranking | CWUR 2016". cwur.org. Retrieved March 30, 2018. ^ "University Ranking by Academic Performance 2016-17 World Ranking". Retrieved March 30, 2018. ^ "World University Rankings 2017". Retrieved September 7, 2017. ^ "World Reputation Rankings 2017". The Times Higher Educational Supplement. ^ "QS World University Rankings® 2018". Retrieved June 29, 2017. ^ "CWTS Leiden Ranking 2014". Retrieved December 2, 2014. ^ "Best Graduate Schools - Medicine". U.S. News & World Report. Retrieved March 15, 2017. ^ "Financial Times Global MBA Rankings 2014". Financial Times. December 4, 2014. ^ "Financial Times Global MBA Rankings 2014". Businessweek. December 4, 2014. ^ "Financial Times Global MBA Rankings 2014". Institute of International Education. December 4, 2014. ^ "National Research Council Data-Based Assessment of Research-Doctorate Programs Report". National Research Council. December 4, 2014. ^ "U.S. News & World Report Best Graduate Schools 2018 University of California San Diego national rankings". U.S. News & World Report. March 14, 2017. ^ "U.S. News & World Report Best Graduate Schools 2015 University of California San Diego global rankings". U.S. News & World Report. December 4, 2014. ^ "Academic Ranking of World Universities 2015 University of California San Diego global rankings". Academic Ranking of World Universities. September 16, 2015. ^ "QS World University Rankings by Subject 2015 - Earth & Marine Sciences". Retrieved September 16, 2015. ^ "QS World University Rankings by Subject 2015 - Biological Sciences". Retrieved September 16, 2015. ^ "QS World University Rankings by Subject 2015 - Economics & Econometrics". Retrieved September 16, 2015. ^ "QS World University Rankings by Subject 2015 - Pharmacy & Pharmacology". Retrieved September 16, 2015. ^ "QS World University Rankings by Subject 2015 - Politics & International Studies". Retrieved September 16, 2015. ^ "QS World University Rankings by Subject 2015 - Medicine". Retrieved September 16, 2015. ^ "QS World University Rankings by Subject 2015 - Mathematics". Retrieved September 16, 2015. ^ "QS World University Rankings by Subject 2015 - Linguistics". Retrieved September 16, 2015. ^ "QS World University Rankings by Subject 2015 - Engineering - Electrical & Electronic". Retrieved September 16, 2015. ^ "Social Psychology: High-Impact U.S. Institutions, 2005-09". ScienceWatch. Reuters. April 3, 2011. Retrieved May 5, 2013. ^ "Oceanography: Most Prolific U.S. Institutions, 2004-08". ScienceWatch. Reuters. January 10, 2010. Retrieved May 5, 2013. ^ "International Relations: High-Impact U.S. Institutions, 2004-08". ScienceWatch. Reuters. August 2, 2009. Retrieved May 5, 2013. ^ "Thomson Scientific Examines Biology's Hottest Institutions, Authors and Journals". PR Newswire. February 20, 2006. Retrieved May 5, 2013. ^ "The Most-Cited Institutions in Molecular Biology & Genetics, 1995-2005". Reuters. March 2006. Archived from the original on May 12, 2008. Retrieved March 26, 2008. ^ "Institution Rankings in Engineering 1997-2007". ScienceWatch. Reuters. July 6, 2008. Retrieved May 5, 2013. ^ "Institution Rankings in Neuroscience & Behavior, 1998-2008". ScienceWatch. Reuters. April 26, 2013. Retrieved May 5, 2013. ^ "25 Best Drama Schools". The Hollywood Reporter. July 17, 2016. ^ "Common Data Set, 2015-2016" (PDF). University of California, San Diego. Retrieved July 27, 2016. ^ "Academic Preparation: A Decade of Change" (PDF). Student Research and Information. University of California, San Diego. Retrieved February 21, 2015. ^ "First-Time Freshmen" (PDF). Student Research and Information. University of California, San Diego. Retrieved February 21, 2015. ^ "UC Student/Workforce data | UCOP". Ucop.edu. Archived from the original on April 5, 2016. Retrieved April 9, 2016. ^ "University of California--San Diego". U.S. News & World Report. Retrieved June 11, 2015. ^ Sutherl, Jacob (January 30, 2019). "UCSD Breaks Record for Number of Applicants for Fall 2019". UCSD Guardian. Retrieved March 2, 2019. ^ "UCI is No. 1 UC choice for California's college-bound high school graduates". UCI News. January 29, 2019. Retrieved March 2, 2019. ^ "UC San Diego Freshman Admission Profile For Fall 2018" (PDF). University of California. Retrieved March 1, 2019. ^ Page, Eric (April 1, 2009). "Oops! UCSD Sends Acceptance E-mail to Wrong List". NBC San Diego News. Retrieved April 30, 2013. ^ Holland, Gale (April 1, 2009). "UC San Diego admissions gaffe dashes students' hopes - again". Los Angeles Times. Retrieved July 16, 2009. ^ "UCSD Enrollment Falls by 272". The Guardian. University of California, San Diego. October 31, 2012. Archived from the original on April 13, 2013. Retrieved April 25, 2013. ^ "Governance at UC". University of California. Archived from the original on December 4, 2008. Retrieved July 18, 2009. ^ "About the UCSD Senate". University of California, San Diego. Archived from the original on May 29, 2013. Retrieved April 30, 2013. ^ "UCSD Administrative Organization Chart" (PDF). University of California, San Diego. Retrieved April 18, 2009. ^ "Undergraduates by Ethnicity" (PDF). Student Research and Information. Total Undergraduate Enrollment Statistics. University of California, San Diego. Retrieved July 28, 2016. ^ "UCSD Student Organizations 2012-2013". Center for Student Involvement. University of California, San Diego. Archived from the original on June 16, 2013. Retrieved April 29, 2013. ^ "UC San Diego Recreation - Sports Clubs". UC San Diego Athletics. University of California, San Diego. Archived from the original on June 18, 2013. Retrieved April 29, 2013. ^ "How to Join". University of California, San Diego. Archived from the original on December 15, 2014. Retrieved May 3, 2013. ^ "UC San Diego". Stanford University School of Medicine. Archived from the original on June 17, 2010. Retrieved April 29, 2013. ^ "Economic Diversity Among All National Universities". U.S. News & World Report. Retrieved June 11, 2015. ^ "Associated Students of UCSD". UC San Diego Associated Students. University of California, San Diego. June 8, 2009. Retrieved July 16, 2009. ^ "UCSD Graduate Student Association". UCSD Graduate Student Association. University of California, San Diego. Retrieved July 16, 2009. ^ "Triton TV". Triton TV. University of California, San Diego. Retrieved April 30, 2013. ^ "KSDT". KSDT. University of California, San Diego. Retrieved April 30, 2013. ^ "UCSD University Centers". UCSD University Centers. University of California, San Diego. Retrieved May 3, 2013. ^ "Campus Celebrates Opening of Price Center Expansion with Launch Party". Ucsdnews.ucsd.edu. May 19, 2008. Retrieved July 16, 2009. ^ "Welcome to the Cross-Cultural Center". Cross Cultural Center. University of California, San Diego. Retrieved July 16, 2009. ^ "The Ché Café Collective". Ché Café. University of California, San Diego. Archived from the original on October 4, 2002. Retrieved April 30, 2013. ^ "Booking". Ché Café. University of California, San Diego. Retrieved April 30, 2013. ^ "About ASCE". AS Concerts & Events. University of California, San Diego. Retrieved April 29, 2013. ^ To, Jacky (April 25, 2016). "ASCE Reveals Secret Sun God Artist: Louis the Child". UCSD Guardian. Retrieved March 28, 2017. ^ "47th Annual Giant Watermelon Drop Held At UCSD". ABC News. June 3, 2011. Retrieved May 3, 2013. ^ "UC San Diego Transfer Student Housing at The Village". UC San Diego Housing. University of California, San Diego. Retrieved April 30, 2013. ^ "UC San Diego College Portrait" (PDF). Student Research and Information. University of California, San Diego. Retrieved April 30, 2013. ^ "Graduate, Professional, and Undergraduate Students with Children". UC San Diego Housing. University of California, San Diego. Retrieved April 29, 2013. ^ "UC San Diego Housing Rates and Services". UC San Diego Housing. University of California, San Diego. Retrieved April 29, 2013. ^ "UC-San Diego to Offer Gender-Neutral Housing Starting Fall 2011". Red State. Eagle Publishing. February 13, 2011. Retrieved April 29, 2013. ^ "About Us". International House. University of California, San Diego. Retrieved February 20, 2012. ^ "The Six Colleges and La Jolla Living". UC San Diego Housing. University of California, San Diego. Retrieved February 20, 2013. ^ "PETA names UCSD most 'vegan-friendly' large school in the United States". City News Service. Southwest Riverside News Network. November 15, 2012. Archived from the original on February 3, 2013. Retrieved November 16, 2012. ^ "HDH Search". housing.ucsd.edu. Retrieved August 11, 2018. ^ "Triton Greeks". Triton Greeks. Retrieved August 6, 2018. ^ "mysite | Chapters". mysite. Retrieved August 6, 2018. ^ "About Us". MGC UCSD. Retrieved August 6, 2018. ^ "Housing or not, the party goes on for Greek orgs - UCSD Guardian". UCSD Guardian. November 7, 2005. Retrieved August 6, 2018. ^ "UC San Diego to Join NCAA Division I Big West Conference". ucsdnews.ucsd.edu. Retrieved November 27, 2017. ^ "UC San Diego Athletics Quick Facts". Retrieved May 3, 2013. ^ Drooz, Alan (November 4, 2002). "Giving it the old college Triton". U-T San Diego. Archived from the original on March 5, 2016. Retrieved February 25, 2008. ^ "NCAA Division 2 Colleges, NCSA College Power Rankings2018". NCSA College Power Ranking Report. Retrieved February 14, 2019. ^ "NCSA College Power Rankings, Top Athletic and academic universities". NCSA College Power Ranking Report. Retrieved February 14, 2019. ^ "Men's Water Polo Colleges, NCSA College Power Rankings 2018". NCSA College Power Ranking Report. Retrieved February 9, 2019. ^ "National Championships". UC San Diego Athletics. University of California, San Diego. Retrieved May 3, 2013. ^ "Earl Edwards Named the NACDA Division II West Region Athletic Director of the Year". UC San Diego Athletics. University of California, San Diego. September 2, 2005. Retrieved July 16, 2009. ^ Yang Su, Eleanor (February 3, 2007). "Athletic fee hike approved at UCSD". U-T San Diego. Retrieved July 22, 2009. ^ Dailey, Phil (March 27, 2012). "UC San Diego's move to Division I gets 'no' vote". La Jolla Light. Archived from the original on May 23, 2013. Retrieved May 3, 2013. ^ NBC 7 staff (May 24, 2016). "UC San Diego Students Vote to Take All Sports to Division I". NBC San Diego. Retrieved May 29, 2016. ^ "Sports Clubs". UC San Diego Recreation. University of California, San Diego. Archived from the original on June 18, 2013. Retrieved May 3, 2013. ^ Robbins, Gary (February 22, 2013). "UC San Diego a Top Surfing School". U-T San Diego. Retrieved May 3, 2013. ^ Brice, John (January 2002). "A San Diego Football Flashback: UCSD's 1968 Pigskin Experiment". San Diego Magazine. Retrieved May 3, 2013. ^ "Notable Alumni at the University of California, San Diego". Google. Retrieved July 25, 2018. Wikimedia Commons has media related to University of California, San Diego.